Cash is king. So said Pádraig Ó Céidigh last week and he would know. Apart from being a senator, he is a successful businessman. In April 2017, John Delaney was king of the Irish soccer republic and it seems he had the cash. His loyal subjects – the Irish football family – needed it urgently and he was happy to help. He loaned the FAI €100,000 so it could pay a bill and he was paid back two months later. It could have ended there . . . but it didn’t. The controversy swirling around the FAI these last few weeks is no longer about a loan for €100,000 – if indeed it was ever just about a loan of €100,000. Because the circumstances surrounding how the loan came about, and then how it became public knowledge, point to an organisation in deep crisis on many levels. During the long and frankly extraordinary meeting last Wednesday between the FAI and the Joint Committee on Transport, Tourism and Sport, Ó Céidigh noted that under John Delaney’s stewardship the continued increase in turnover and revenue at the Association was hugely impressive. He also noted that the organisation is returning a surplus every year. But, he said, cash is king. You need cash to pay the bills. Once in his business life, he revealed, he was offered a loan by an employee to help his company through a difficult patch. He turned it down as it happens, but with his business brain switched on he admitted to being puzzled by Delaney’s loan and the fact that it had not been recorded in the accounts. It raised a flag for him too about the FAI as a going concern. There’s a small company called Gerfurn Ltd which has had cash flow issues in the past. John Delaney is the company’s majority shareholder and lent it almost €40,000 over two years ago. He also confirmed in its annual accounts at the time that he was “willing to provide financial support to the company for the foreseeable future sufficient to allow the company to continue as a going concern”. 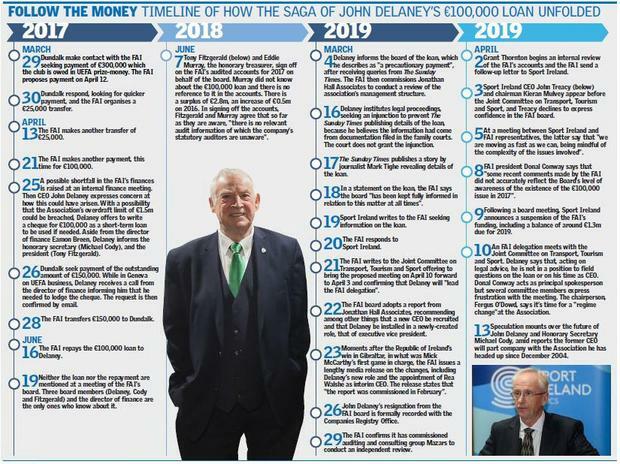 Delaney also lent another company of which he is a director – JMPHE, a building and property-rental company in which he owns a 25 per cent share – almost €250,000. So he has a track record of helping out companies he is involved with. Nor should it be forgotten that prior to becoming the FAI’s chief executive at the age of 37 he was already regarded as a successful businessman in his own right. Lending the FAI money, however, is not quite the same as putting your own money into a company you have a financial interest in. Yes, in the strictest sense the FAI is a company, registered as such with the companies office and all that, but its real shareholders are all those people invested in some way – physically, emotionally, financially, or whatever – in football in Ireland. At the time Delaney’s loan became necessary, Dundalk were pushing hard for payment of prize-money due from the club’s European exploits. This money had been paid to the FAI by UEFA in January 2017, but there was still a sum of €300,000 outstanding by the end of March and it appears the Association was struggling to pay it. The UEFA money, in classic Fr Ted fashion, may have just been resting in an account. Alternatively, that UEFA money may have been used to pay other bills. And Dundalk may not have been the only creditor knocking on the door during those weeks in March and April of 2017. In which case, the Delaney loan takes on a different guise. Maybe it was just another stunt pulled by the Association as it lurched from one overdue bill to the next, stumbling along like some poor couple trying to juggle paying for the weekly shopping out of the following week’s children’s allowance. This is what raised the flag for Ó Céidigh: How could a company with an annual turnover of €50m and 24 bank accounts be stuck for a hundred grand? It just doesn’t make sense, unless the FAI has been even more on its uppers than any of us knew. And still, it could have ended there, with the €100,000 loan given and repaid. But it didn’t – because of what happened next. And the sequence of events which followed Delaney’s loan all lead to one simple question: What was the big secret? This is where we enter the realm of speculation. Let’s take the worst case scenario, that the FAI was in such dire straits at that time, quite literally down to its last few grand, that the loan was the only thing that would save them from . . . well, save them from what? What was the FAI afraid of? Or rather, what were those few people (the then-finance director and three board members, including Delaney) who knew about the loan worred about? Is it that the FAI was afraid of being unmasked as some kind of snake oil salesman in a shiny suit? If news that the Association could not pay Dundalk the rest of their prize money, a mere 300 grand, got out they would be exposed as charlatans. Was the FAI’s pride such that the Irish football family, and the Irish football family’s sponsors, could not possibly find out that behind the shiny suits all that was left was some kind of three-card trick? If hubris, perhaps, was at the heart of keeping this loan out of the public arena, the tougher question remains: Why were details of the loan and its repayment kept from the board and the auditors? Sometimes the answer to a question can be as simple as the question itself. Question: Why did certain people keep details of the loan secret? A whole series of failings, the result of years of allowing the Association to drift in a certain direction, and for one strong personality to take hold, kicked into action on this one transaction to keep it hidden for two years. This is a collective failure from which no-one can be absolved. There is no redemption here from this one. Because even those board members who were in the dark on this were complicit by their silence over many years. The fact that none of the current board has publicly offered to resign is troubling because they all must go in order for the process of restoring confidence in the FAI to begin. All the reports in the world won’t change that. It looks now like there will be some heads on a plate, including Delaney’s, but that will not be enough to restore the State’s confidence. It is becoming increasingly apparent that a clear-out is needed if significant State funding is to be restored. Maybe the FAI executive and board members who sat in that Oireachtas chamber last week had nothing to hide other than their Association’s hubris. Or maybe they remain terrified that the rest of us are about to find out that the emperor has no clothes. And maybe, just maybe, even today the snake oil salesmen in the shiny suits don’t realise that we already know that the FAI management structure is not fit for purpose. Yes, the FAI presented a united front to TDs and senators last Wednesday. Sadly, for Irish football – and for Irish sport – it was a chaotic front. They were hiding in plain sight. On legal advice, the former chief executive would not answer any questions on his time as chief executive, and the interim chief executive could not answer any questions pertaining to the time of the loan; the current president is only in office since last August (although he has been a board member for over 13 years); the financial director was only in place a few weeks and couldn’t answer questions about past financial transactions; the communications director was also only in place a few weeks and couldn’t say then and there who had signed off on the statement that the board had been aware of the loan . . . on and on it went. As the front man last Wednesday, president Donal Conway repeatedly made out that the Association was doing its best to help the committee. This clearly was not the case. They were, said Imelda Munster, “giving two fingers”. If the FAI were keen to help, and to give answers to questions, they could have done so. Conway himself only seems to have found his voice in the last week. The former CEO could have provided more details, without prejudice and without infringing any of his rights; the interim CEO – who has been a member of the senior management structure at the FAI for the last two years – could have been briefed on events; the chair of the board could have been briefed, or made it his business at least to get answers from his predecessor, among others; the new finance director could have been briefed . . . and so on. The majority of questions asked by the committee members were easily anticipated and it is stretching credibility to think that many of the answers could not have been easily obtained in advance. But there is no hiding anymore.